How Does Dog Urine Kill Grass and Lawn? So, you’ve noticed that your green lawn is turning brown and yellow? Though many reasons could cause this, your outdoors dog is most probably one of them. 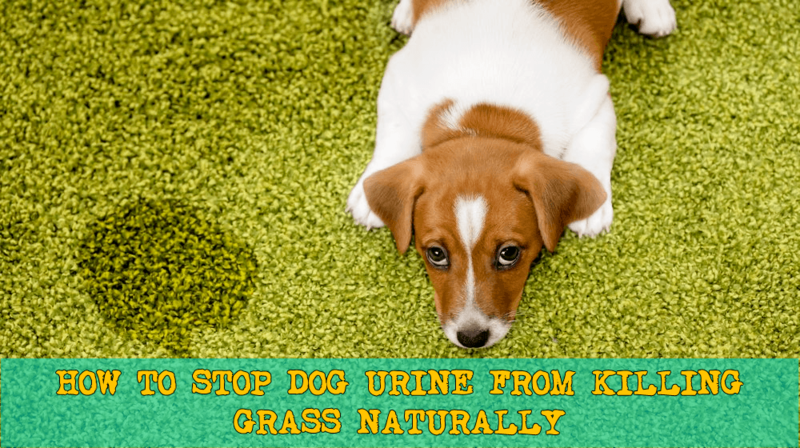 Urine is known to kill grass, so unless the problem is treated, you’ll have those ugly patches all over your yard. The good news, at least they’re not peeing in the house. Right? Well with that said, what can you do? Well, first you must understand how does this happen. Knowing what precisely causes the problem is one step nearer to fixing it. Lucky for all dog owners, there are ways to prevent and fix the issue. Continue reading to find out what you can do for your lawn to save it from burning. Don’t worry; none of these steps require you to spread countless potty pads across your yard. These are simple and most importantly natural, so make sure to try them before you turn to any commercial solution. Though many things may look like a logical explanation, urine acidity is by far the most popular belief. Still, that’s not entirely what causes the problem. What burns the grass is alkaline urine and the nitrogen included in your pet’s urine. Because they eat meat, dogs intake a lot of protein. This protein is then broken down resulting in nitrogen-laden byproduct. This nitrogen gets transferred to the grass as your dog urinates. Though this can sometimes be beneficial to your lawn, too much of it can be fatal. There are meals for dogs with low-protein, but you want to consult a vet first before putting them on a specific diet. So, if your pup pees in the same spot all the time, the grass there will most probably burn. It sounds unusual, but females stand a better chance of ruining your grass than males do. This has nothing to do with pee itself but with the different way in which females urinate. While males lift their leg to pee and mark territory, females pee entirely in one place. If the lawn in your yard is recovering from drought or any kind of stress, it might be more susceptible to burn. Anything other than healthy lawn is easily affected by pee. This means some might burn more easily than the other. Also, don’t let your dog pee on any recently seeded grass because that one is fragile. Another thing that might help pee burn your lawn better are the fertilizers. These make the grass more susceptible to burn. While some lawn might be able to fight off the effects of urine and survive the burn, fertilizers will most certainly make that hard. However, the cause isn’t entirely lost. Now that you understand what can contribute to pee burning the grass, you can easily take measures against it. If you’re looking for a specialized product, then visit our best dog urine remover guide. There are two ways in which water can help you with the problem. First, you should make sure that your dog drinks enough water on a daily basis. This will dilute its urine making it less concentrated and healthier in general. You should also pour water on the same spot where your dog has peed immediately after. This way, you’re diluting and washing off the urine off the grass and into the soil. It’s crucial that you’re quick with this to reduce the burn. Leaving the urine there for a long period will undoubtedly result in burns. Still, this might save the lawn for a moment, but it will go into the soil. By providing a balanced diet, you reduce the chances of possible burns. Its diet should be as diverse as possible with protein intake being especially important. When it breaks down protein becomes nitrogen, the excess of which is then excreted in the urine. This means that high protein diet results in concentrated urine that will most definitely burn your lawn quickly and beyond repair. If your dog is on such a diet, pay special attention to where it pees so that you can wash it off immediately. Have you heard about using baking soda to neutralize urine odors indoors? It’s an easy solution since we all have the ingredient in our home. Since it’s salt, baking soda dries out the problematic spot with ease. Using baking soda on grass to try and neutralize salts or nitrogen can have an opposite effect. Its salty nature could damage and injure your lawn which is why we don’t recommend you do it. Another popular solution is adding tomato juice to your dog’s food. It’s believed that this balances nitrogen levels, reduces salt and alters the pH level of pee. Still, there’s no solid evidence that tomato juice can alter nitrogen levels in urine and more importantly, pH level isn’t what causes the burns. Even though it might be true, there isn’t any scientific evidence to back it up which is why it’s up to you to decide whether you want to take the risk and try. Washing the problematic spot with water is still a more reliable solution. Apple cider vinegar is known to fix many problems around the house regarding different stains. Still, just like tomato juice, it’s a myth. It’s believed that adding ACV to your dog’s water makes its pee less acidic. Again, not only there isn’t any evidence that we could rely on in this case, but we can’t assure you it’s safe. There are better ways that are known to help the problem rather than possible cause trouble. If you feel like you want to try adding apple cider vinegar to your dog’s water, consult your vet first to check if it’s at all safe. As we said, nitrogen is only to blame for your burnt grass, so the only solution is to reduce its levels. The best-known way to reduce nitrogen in the urine is to drink more water. Still, while it might be easy for humans, it’s not that simple to make your pup drink more than it already does. Firstly make sure the water is always fresh. Another thing you can do is add a salt-free broth to its water to encourage the dog to drink a bit more. Still, make sure not to do this way too often as your dog might lose all interest in plain water. While you can also prevent this, there are some ways you can do to fix it once it’s happened. Keep in mind that all urine and lawns are different so the results may vary. Healthy and robust grass can endure a lot and won’t just die after the first time your pup pees on it. First, make sure your soil is healthy as it might be what’s actually causing all the trouble. Also, it’s important you check the overall health of your entire lawn as frequently as possible. By tracking where your dog pees and where the burnt spots appear, you can figure out if it’s indeed the pee that’s causing the problem. Making these little steps can help you spot the problem and work on preventing it from happening again. Your choice of fertilizers is crucial since it’s proven that they have a strong connection with grass burning. They usually have enough nitrogen on their own, so adding more from urine makes it even worse. Make sure you use natural fertilizers that have more organic ingredients. These have more minerals that help your grass grow than what you can find in commercial fertilizers. Still, be careful not to overdo it as these also have some nitrogen, and too much of anything isn’t a good thing. Although this isn’t a very popular method, it’s a simple way of helping your grass. It’s a type of limestone that provides nutrients and helps change the pH levels. It can’t affect the lawn itself, but rather help the soil become more natural and overall better for lawn growth. It helps soil be less sour and acidic which then results in better quality and rapid growth of new and healthy grass. Sometimes it’s also called dolomitic limestone or simply dolomitic lime. Soil amendments are often also called magic bullets for their ability to help recover any type of land. However, in this case, it’s recommended you go for the microbe-based amendments as they’ve proven to be the most effective. These help increase microbes and their benefits in the soil which results in efficient breaking down of salt. They help your land handle the excess of nitrogen as well as recover from it. The market offers some options, too, so you can choose different amendments for different types of soil. The simplest solution might be to get the type of grass that’s a bit more resistant to dog pee. Some handle it better than other, so this is something to pay attention to. Some types, like perennial rye and Fescues, are a bit more resistant. They are stronger and take longer to show any signs of damage by urine. More so, if the damage does happen, this type takes less time to recover and will grow out much quicker than most other types. If your dog does its business outside, it’s just a matter of time before the lawn in your yard shows signs of burning. It’s inevitable, and unless you do something to prevent it or help it recover, you’ll have plenty of dry, yellow patches everywhere. Luckily, something can be done for the good of your lawn. As you can see, there are many ways you can try to fix or prevent urine from making these burns. However, not every method will be equally effective based on our research and evidence we gathered. You can experiment and try each method to see what works for you the best. Train your dog to pee in different spots, so it’s not all concentrated in one area. Make sure its pee is diluted one way or another and also don’t forget to help the soil grow back some healthy grass. How Long Can a Dog Hold It’s Bladder?